We are a sports and activewear company with a difference. We don’t just want to sell kit, we want to bring fashion and function together to create clothing that makes women feel good about their bodies and inspired to get active. The key feature of our brand is that we donate 5% of every sale back into projects that support women’s and girls’ sport. The Rise Midlayer will keep you comfortable and warm this winter. 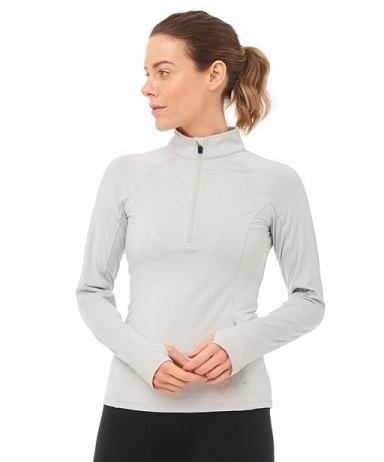 Whether exercising outdoors or travelling to and from the gym, this insulating half-zip midlayer is the ideal basic to wear underneath outerwear and jackets. Made from a soft, brushed jersey with extended cuff and thumbholes. Available in mint, cloud grey, black and white. Insulating Soft Jersey Windsor Mid Layer Product Review- R4W member. Love this product! Wonderfully soft, stylish and fitted perfectly. Very Versatile as its smart enough to wear with jeans for an autumn walk.